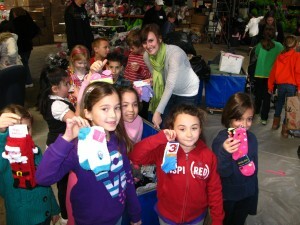 Children with new socks collected for the homeless for The Joy of Sox, a nonprofit that provides joy to the homeless with new socks. Sock drive and fundraisers have been held at colleges, schools (catholic, public, private and charter schools), churches and all sorts of businesses. This page will thank and recognize those places for helping provide new socks for the homeless…and helping make homeless toes happy toes! If you would like information on how to conduct a sock drive at your school, workplace or…anyplace please click here to view our how to conduct a sock drive page.